Here’s a link to a website that has some really amazing examples of charts built with D3.js. Please have a look at it, so you can be amazed and then realize how pretty, bloody cool some of them are. Then you can, relax, pop a beer, and sleep well tonight knowing that you can have those in Dynamo. Parallel Coordinates: Yes, for those of you loving some large and complicated data sets. There simply isn’t a better way to visualize a multi parameter data space. Stacked Bar Chart: Another classic of data visualization. Happy visualizing your dataz, as Brian Ringley would say. Ps. There is a GitHub page where you can download the source code and submit issues. Please use it! Mandrill Git Hub. Ps2. Mandrill as is currently is built against Dynamo 1.1. 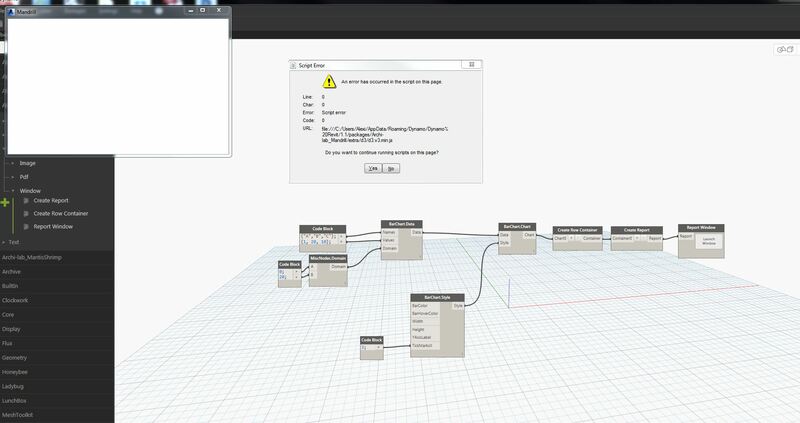 I prefer using it out of the stand-alone Sandbox, but go ahead and give it a whirl in Revit. I haven’t much tested it there though so thread carefully. At first thanks for sharing this wonderful package. I am having issue in running the script. 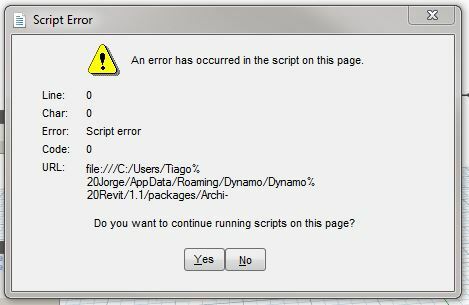 I get “Script Error”. I have screenshot attached. After that you will know that, you are feeding the same color to both the bar and hover color which basically defeats the purpose of having a hover function because it will not be distinguishable. Anyways. It’s your chart. Also, your style node, is clearly missing an input. You can use a default value. Just right click over that input and click on the default value. You width and height are respectively 3 and 6. That’s in PIXELS. Please read the primer. I would recommend a value larger than 100px since there are margins hard-coded into it that need to be subtracted from that value. Hello Konrad, first thank you for your work. You are amazing.. I tried to install it on Dynamo 1.2.0 but could not. If it was in 1.1, as I do? Just copy the entire folder from Github, or is a specific folder? You can just download it from the Package Manager directly. Search for Mandrill. Thank you so much Konrad. Nice work, I love a good chart..! The approach I used was with an intermediate database that Dynamo writes to/the chart reads from. But being able to do it directly in Dynamo seems much better. It seems to me that people are having issues with the plug-in. I need to probably test it a little more before claiming that it would be a better approach that you were attempting with PowerBi. I really like the idea of creating charts from a data base connection. That seems like a lot more efficient way to organize your charts, especially if you can store your results on the web. I tried the first example of barchart that appears in the primer but these errors occurred. 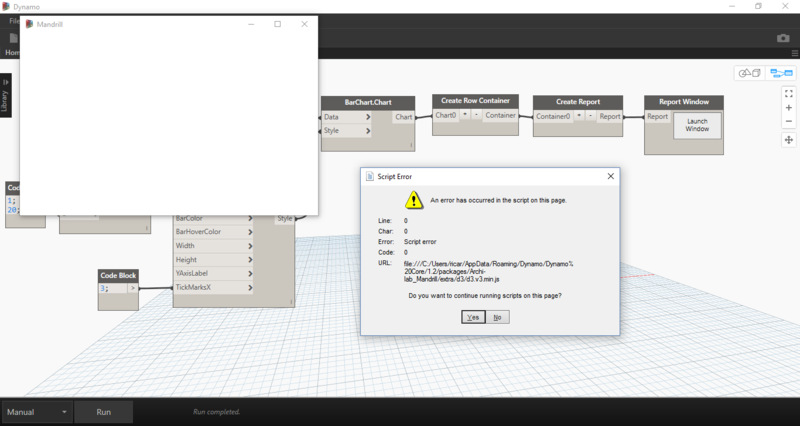 Besides I was in version 1.2 of Dynamo, there may be some other problem? You think what Dieter is seeing is similar to your experience? https://github.com/ksobon/Mandrill/issues/4 This might be a bigger issue. I might have to pull the plug-in if more people are having this issue. I never realized it since it works just fine on my machine both at work and at home. Sorry for the inconvenience. There is nothing to apologize Konrad. Thank you so much for your attention. I will follow the on Github. 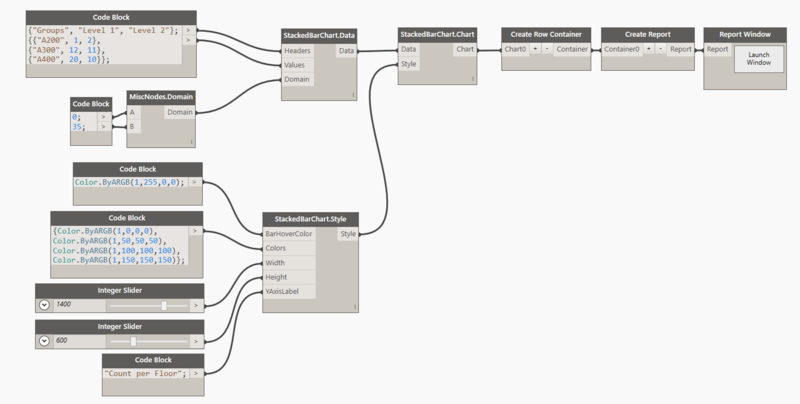 Can you try a different chart, use a CSV data, restart Dynamo. I am not sure what is causing this error and honestly I need more users to investigate this for me or I will not be able to solve it. Are you launching this from Revit? 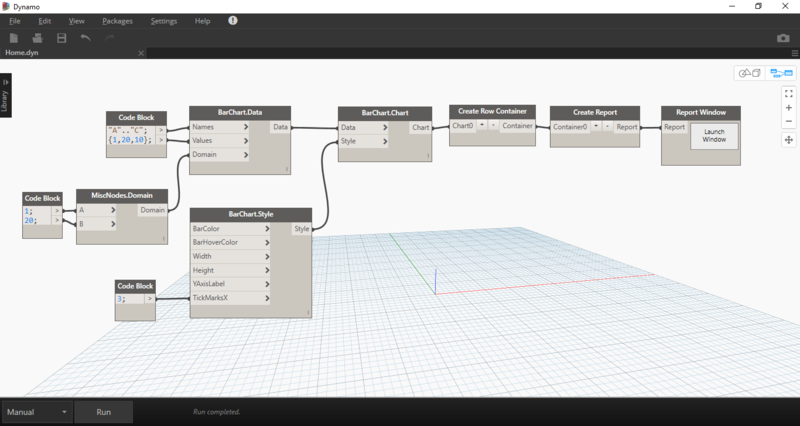 Dynamo Studio or Sandbox version? What version of Windows are you on? Are these files unblocked? It was fixed in latest update to Mandrill, just make sure to use the Chrome Window instead. Let us know if there is anything we can test on our side. Should be fixed with the latest update. get it from package manager and use the Chrome Window node to display charts. Cheers! Great tool, thank you on that ! Hi Konrad, I don’t know why my bar and line chart is not working. 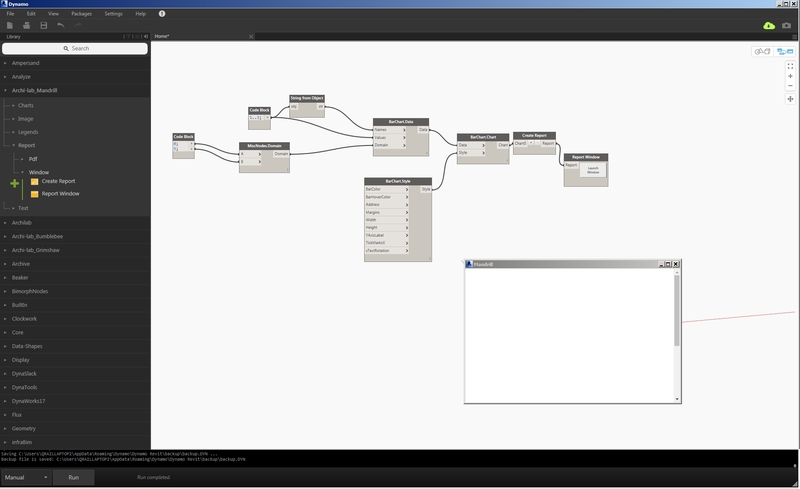 Revit 2017 or 2015 and Dynamo 1.2.1. Pie chart is working properly. Is there any option (or plans) to create a Geometry output for the table geometry? This would be insane! I am not sure i follow. Care to share an example? Maybe an image of what you have in mind. Is it possible to import created chart into Revit as a drafting view for instance? That’s a great suggestion. Can you log it here: https://github.com/BadMonkeysTeam/Mandrill Thanks!